The UNESCO Digital Art Award 2007 is organized in association with the Sharjah Biennial 8 (4 April - 4 June 2007, Sharjah, United Arab Emirates) on the theme of "STILL LIFE - Art, Ecology and the Politics of Change". Young artists are invited to reflect on how urban spaces and city environments could be transformed into creative outlets cultivating artistic innovation and new form of expression. Potential applicants to the award are asked to conceive and design their creative projects that are integral to the theme of sustainable urban development. - Young, talented people from under-represented countries are especially encouraged to participate. Two solo exhibitions, Rebecca Purdum Paintings and On the Edge, a video by Miguel Angel Rios, will be on view at the Tilton Gallery from November 28 - December 22. The exhibitions feature Purdum’s large-scale abstract paintings from the past three years, and Rios’s most recent video installation.The Tilton Gallery is located at Eight East 76 Street, between Madison and Fifth Avenues. Gallery hours are Tuesday through Saturday 10 – 6 and Monday by appointment. Rebecca Purdum’s paintings are shifting fields of color that suggest atmospheric space filled with light. The movement in Purdum’s paintings is subtle, often nearly imperceptible, flowing from dark to light and from formless to form. Color moves in micro-tonal steps, with small strokes of individual hues massing to create clouds of colored light. Paradoxically, the artist paints with a real physical directness, usually using her gloved hands to apply marks and layers of pigment. Purdum’s recent paintings emphasize the material reality of paint, with oil color building up a textural presence on the canvas. Purdum’s art is meditative – the work of reiterative practice, and of realizing the contours of one’s own consciousness. Each of Purdum’s paintings is a kind of existential space of perpetual investigation, emerging awareness, and of hard-won grace. As Michael Kimmelman wrote, “It is almost impossible not to like Rebecca Purdum’s…works, so beautifully painted are they and so tinged with what seems an evanescent light.” The artist has exhibited her paintings at the Tilton Gallery since 1985. Her work was has been exhibited at the Whitney Museum of American Art, The San Francisco Museum of Modern Art, and The Corcoran Gallery of Art. On the Edge, a two-channel video by Miguel Angel Rios, is based on the popular Mexican playground game, El Juego del Topo. The installation immerses the audience with the frenetic activity and sound of the whirling of spinning tops. In this work, teams of black and white tops compete for a dominance of white grid in a dark field. Rios has observed that, "My idea was to use this game as a metaphor for our times. In this film, I express the terrible moments in which we are living, where we can feel like life is worth nothing. This is also about competition, power, violence and chaos. The viewer can identify with the powerful or the weak one. It is about war." As with Rios’ previous work (sculpture and mixed media installations) the artist focuses on the European conquest of Latin America. On the Edge follows Don’t Look for Me You Won’t Find Me, a 2003 video in which the artist encounters the visionary power of the Mexican desert. Discovery of the Amazon, a collaborative piece done with Sergio Vega explored the apocryphal battle of an early explorer with the “amazons”, indigenous women-warriors. Rios was born in Argentina and divides his time between Mexico City and New York. He has shown his work extensively in America and Europe, with recent solo exhibitions at LACE (Los Angeles Contemporary Exhibitions) and the Hirschorn Museum and Sculpture Garden, and group exhibitions at the Shaghai Doulon Museum of Modern Art, the Miami Art Museum, and the Phoenix Art Museum. Shooting Live Artists 2003 is a collection of challenging art projects that combine bold contemporary art with new media production. Six leading contemporary artists were commissioned by the BBC and the Arts Council of England to produce work that fused technology with live art performance. Following the success of Shooting Live Artists, Melt is offering opportunities to explore the artistic, creative and technical content possibilities of cross platform media. Melt is a new £1m programme which gives annual R&D grants of up to £50k to leading artistic, media and technical talent to explore the creative and economic possibilities of new and emerging media platforms. Melt is managed and delivered by The Culture Company working with the BBC, Channel 4 and PACT with funding from South Yorkshire Objective 1, Yorkshire Forward, and the Arts Council of England and in partnership with Screen Yorkshire. An uncompromising advocate of Java compatibility, Dr Graham Hamilton - Sun Fellow and VP - has parted company with the new "age of participation" Sun in the wake of its decision, announced last week, to open-source its implementation of Java. One of the principal voices against open-sourcing Java, the departure of Hamilton was nonetheless greeted with sadness by proponents of the cause like Danese Cooper, who notes "I know many at Sun and in the larger Java community were sad to see him go." Geir Magnusson, while conceding that he and Hamitlon "didn't see eye to eye," nonetheless declared him "one of my heros" and called it "a significant loss for Sun, and the Java ecosystem as a whole." "I'm proud to say that I've worked with Dr. Hamilton," Magnusson added, "and hope to do so again in the future." Chris Humphreys’ strangely beautiful paintings depict that misty area in which nature gets caught up between fantasy and reality. His first solo show Woodland Chicken World at Transition Gallery, enhances this sense of mystery with a touch of exotic orientalism to give his new paintings of common or garden birds an aristocratic grace.Influenced by Chinoiserie, a centuries-old decorative style based on highly embellished and exaggerated Chinese design, Humphreys’ sets his birds (most particularly chickens) in an intricate, ornamental world of paint. Chinoiserie has an element of the homemade about it in its often misinformed imitation, giving it not only an element of the absurd but also an attitude towards borrowing and history, which is pertinent to Humphrey’s practice. Humphreys’ very contemporary paintings have a fluidity and brightness that has made him highly popular with both interior designers and academics alike and Woodland Chicken World (part of Transition Gallery’s Supernature season) is accompanied by a talk on Chinoiserie by Gill Saunders of the V&A on Monday 11th December at 7pm. Meanwhile Humphreys’ humble chickens freed from their restrictive pens and given a sense of elegance and dignity in their new gallery location take on a level of art seriousness where the birds, the paint and the decoration are all brought to the same level of heightened reality. How will we watch TV in 10 years? Leading figures from the television world have given their predictions for how TV will evolve in the coming years - and what it means for viewers. 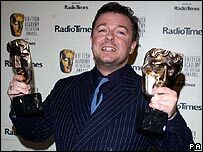 Ricky Gervais is one of the first big stars to create original video and audio material just for the internet. The Office and Extras star's radio-style audio podcasts on iTunes have become record-breakers, while his video podcasts have also attracted a large following. Why did you start making audio shows just for the internet? "Anything that increases artistic freedom is exciting for me. We didn't have a boss. We didn't have rules or restrictions that you do on radio. We could do it when we wanted, for as long as we wanted. We could put it up there and then people would go to it at any time. But I suppose the most exciting thing is that it's global. If you've got a computer and an MP3 player and a phone line, you can listen to it all around the world. And they did. And that's because The Office is shown in 80 countries." What has the response taught you about how people want stuff on the web? "I think that first series got about four to five million downloads. And it's still going. That's a lot of people. That's quite a big TV show. And I think it was Karl [Pilkington, sidekick] who said: 'Why don't we charge for it?' He'd just given up his job. We honestly didn't do it for the money - we did it as an experiment. We thought - would people pay? And I think they did because they didn't have a choice, it wasn't available free any more. But I think they also thought it's only a quid. And it wouldn't have worked if it was a breakfast show every single day of the year for 10 years. In all now we've had about 10 million downloads, but that will do for now. It's not going to be the main part of our business because I get bored very quickly. I have the attention span of a child. We'll do some more but it was never meant to be a realistic business venture. It was more like I wonder if it could be a business venture. It worked out for us." Are you going to start selling original TV-style video online or do deals with websites to create original video? "We put out some free videos. We just made little films, little sketches. Sometimes it was just us chatting. Now I don't think we could do that as a business venture because with audio, you can compete with anything. You can compete with comedy records or with radio shows if you've got a decent microphone and something to record it on and something to listen back on. Whereas you can't compete with great DVD and video. You can't knock up an episode of The Sopranos or 24 on a little handheld digital camera. So I don't think that would work. I don't think you'll ever be able to sidestep TV or DVD. But TV companies will embrace it. With the American Office, they did things called webisodes where some of the peripheral characters had their own storylines and they did little 10-minute things and put them out. Now that's exciting for fans, it's like a DVD extra or something. And it's an advert. You might come across that before you've actually sat down and watched The Office on a Thursday night on NBC. " What if someone like Google offered you a lot of money to make a TV-style show - but just for their site? "I could see it happening but I'd think - what's the point? If it's going to be as good as watching it on TV, then it's probably going to be as expensive. And if it's as expensive, then why don't we just put it on TV? I don't think TV's got to be running scared yet. And of course it's fighting back. One of the greatest inventions of the past few years is Sky+. The good thing about watching things online and watching things on Sky+ is that you do them when you want - no-one tells you when. The bad thing is it loses a bit of the common consciousness. There is something nice about everyone sitting down and watching a programme at the same time then talking about it the next day. That's exciting as well." How do you feel about people who watch Extras or The Office on illegal sites, which may prevent them from buying the DVD? "I don't know that it does. I'm guessing here and I'm sure record companies and networks would say it is damaging. But is it? I haven't seen it being too damaging because at the moment, most people aren't downloading. Your aunts and uncles, they're not going on YouTube or scouring the internet to find On the Buses. But they will see it in Woolworths if someone re-releases it and says On the Buses Retrospective. So that's still the bigger business at the moment. What is exciting about this is choice, and we don't know where it will go because we don't know how many people soon will have a computer and an iPod. I'm sure when the BBC first launched, they were going: 'Ah, not many people have got tellies. Who's watching this?' So it's good to get your act together. And then people catch up with the know-how and the means to watch it." Have you got any favourite online viewing? "I still wouldn't call myself a big internet buff. I've got e-mail. I Google things now as opposed to going to the library or Encyclopaedia Britannica. But there are half a dozen websites that I go to - the BBC, some entertainment websites and YouTube. And that's about it. I probably spend an hour a day online and that's enough really. Whereas it would still be three hours in front of the telly. So telly's still winning." Originals from the Cosmic era - compiled by DJ Mooner! Italy, 1976: In a luxurious discotheque on the Italian Adriatic coast, every weekend two American DJs called Bob and Tom play records that are just making history in their hometown NYC at the legendary „Loft“. Bob and Tom are resident DJs at the „Baia Degli Angeli“, a gigantic club with various floors, fountains, swimming pools and lots of glitz of the Jet set. After the Baia closes due to a drug raid, Daniele Baldelli, inspired by the „Baia Sound“ starts DJing in a new club called „Cosmic“ in Lazise. Unlike Italodisco, Cosmic or „Afrofunky“ was never exported broadly; it has always stayed a local party phenomenon. That’s one of the reasons why it wasn’t really exploited commercially yet like many other 1980ies genres. Today producers as Lindstrom, Prins Thomas or DJ Harvey caught the spirit and labels like Gomma, or Eskimo are deeply inspired and now try to create dance tracks that have a similar atmosphere. Mooner has been running his label, "Erkrankung durch Musique", since 2000.He has also taken part in Punk-Rock project 'Club le Bomb', since the success of Zombie Nation´s „Kernkraft 400“ (Top Ten hit in UK, Greece, Holland, Belgium... in 1999/2000) which he co-produced, a less commercial project that happened at an illegal location beneath the city of Munich in an abandoned underground water powerplant. It's a wild style club that is an art project at the same time. Together with Benjamin Bergmann and Catriona Shaw (Queen of Japan), they organised nights as 'Club le Bomb' through the whole of Europe, collaborating with artists like DJ Hell, Sven Väth, Patrick Pulsinger, Queen of Japan, Jeans Team, and many, many others. Also Hart of Noise (with Generation Aldi-man Bülent Kullukcu) was a cutting edge project between Art, Music and Pranksterism, an irony of the big names in the Techno-Biz. The project climaxed in a liveshow at a Cocoon party where about 500 kilo of food and electronic trash were thrown into the audience. Zombocombo, with Polly Ester (of Kamerakino) and KITT Bang is the current occupation and longtime project. They organise monthly events at Munich´s club „Registratur“, where they throw parties with music, clothes and shows that go along with crazy mottos such as „Medical Congress“, „Tales of Voodoo“ or „Space Gay Cowboys“. His label, Erkrankung, features debut works of artists such as Steril, Hong Kong Counterfeit, Queen of Japan, The Magnificents, Mix Mup, Vostok, Nicolas Courtin, Auto, Acid Boy Chair, as well as projects like the Sid-Musique, a compilation of international artists working with sounds of antique computers like the Commodore C-64. Many of these records had been setting new genres; mostly years ahead of the time they went „hype“-like Commodore sounds, Elektro-Punk, „Elektroclash“, or the Acid-revival. Mooner's sound is influenced by obscure B-sides of Italodisco, trashy House, Elektro, Acid, Rock, Punk-Funk, Krautrock and the wildstyle mixing of Club le Bomb. Mooner´s further influences on his unique DJ mixing style relate to his Mom´s psychedelic record selection, the widespread interest of music by 70s north-italian Cosmic Music scene. Also he was one of the first DJs to buy an iPod for pro use, filled with obscure B-sides and demo versions. Phishing continues to show off-the-chart growth, with few signs of slowing down, according to two market studies published this week. The number of U.S. adults who have received phishing emails has nearly doubled since 2004, from 57 million to 109 million, according to a study from Gartner Inc. released yesterday. Financial losses stemming from phishing attacks have risen to more than $2.8 billion, the research firm says. A separate report issued earlier this week by the U.K.'s Association of Payment and Clearing Services (APACS) confirms Gartner's conclusions. In the U.K., the number of reported phishing incidents has skyrocketed from 312 in the first half of 2005 to 5,059 in the first half of 2006. "The good news is that, this year, fewer people think they lost money to phishers, but when they did lose, they lost more," said Avivah Litan, vice president and distinguished analyst at Gartner. "The average loss per victim nearly quintupled between 2005 and 2006." Phishers prefer to attack high-income adults earning more than $100,000 per year, according to the Gartner study. Those with six-figure incomes reported receiving an average of 112 phishing emails in the past year, compared to an average of 74 across all income brackets, Gartner says. High-income adults also lost more money from phishing attacks: an average of $4,362, almost four times as much as other victims, the research firm says. Most of the attacks over the past year have been targeted at online banking customers. According to the APACS study, U.K losses from phishing were approximately $27.7 million in the first half of 2005; that figure rose to almost $43 million in the first half of 2006. And the attacks are becoming more creative, Litan says. "Cyber-criminals are starting to shift away from attacking online banks directly, and they are leveraging less conventional brands and/or using hard-to-detect social engineering methods to reap financial gains," she says. For example, many attackers are impersonating other entities that use banking information, such as PayPal and eBay, she says. Phishing defenses are getting better, but they still aren't stopping the attacks, Litan says. "Countermeasures such as phishing detection and take-down services deployed by banks, ISPs, and other service providers are obviously not sufficiently widespread or effective," she observes. Upgrades to browsers such as Microsoft's Internet Explorer and Mozilla's Firefox haven't helped much, either. "Many of the browser upgrades are still incomplete and immature in terms of protections afforded," Litan says. "For at least two more years, phishing attacks will continue to increase, since it’s still a lucrative business for the perpetrators." And enterprises will find these attacks difficult to stop, Litan warns. "The anti-phishing measures some enterprises have put in place to protect their brand and their consumers are not working. Phishers are moving from site to site to launch their attacks more quickly than ever. The average life of phishing sites has gone from one week a couple years ago to about one hour in 2006. "Within a year or so, phishing sites may be user specific -- that is, a single site will be set up to launch a phishing attack against a single user. It’s no wonder the detection services can’t keep up with these rapid criminal movements." Both APACS and Gartner said the most effecive means of preventing phishing losses is to teach users not to open emails from untrusted sources. APACS also advises to consumers to type in their URLs, rather than using links, and to shop at SSL-enabled sites.